Description: Brownish or grayish above; underparts grayish to whitish, but not white. Scaly, sparsely haired tail uniformly dark; longer than half total length. Prominent ears. L 12 3/4-17 7/8″ (325-455 mm); T 6 3/8″-10 1/8″ (160-255 mm); HF 1 1/8-1 5/8″ (30-40 mm); E 5/8-1″ (17-27 mm); Wt 4-12 3/8 oz (115-350 g). Similar Species: Norway Rat has tail proportionally shorter (less than half total length). Rice rats have tail darker above than below. Wood Rats have white underparts. Breeding: Breeds year-round; several litters per year, each of 2-8 young; gestation 21-26 days. Sign: Similar to sign of Norway Rat. Habitat: Mainly around seaports and buildings; sometimes in natural habitats. Range: Southern and coastal U.S.; inland in West, as far north as W. Nevada; east of Rockies to E. Arkansas, W. Kentucky, N. Alabama, N. Georgia, and most of North Carolina and Virginia. Most abundant in South, along Atlantic Coast north to E. Maine, and along Pacific Coast to extreme SW. British Columbia. The Black Rat occurs in a great many varieties and races, or subspecies, of which few are actually black, despite the common name. Believed to have come from Southeast Asia, this species spread through Europe centuries ago, long before the arrival of the Norway Rat. It appeared in Central and South America in the mid-16th century, evidently carried there aboard Spanish ships; it arrived in North America with the early colonists at Jamestown in 1609, and gradually spread across the continent. Formerly much more common, it has often been displaced by the slightly larger and more aggressive Norway Rat; this may be because the Black Rat does better in tropical climates and the Norway Rat in temperate climates, rather than because of overt competition. As Black Rats are far more common than Norway Rats on ships, they continue to be reintroduced at seaports. Excellent climbers, in the south they live in the upper stories of buildings; they also make nests in tangled vines and in trees. Omnivorous but partial to grain, the Black Rat does enormous damage in docks and warehouses, contaminating with its droppings what it does not eat. 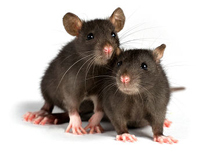 Like other rats, it carries a number of diseases, including bubonic plague, which is transmitted by its fleas. Snakes, owls, dogs, and cats are its chief predators. Description: Color varies greatly with habitat and geographic area. Often grayish to reddish brown above; white below. Tail distinctly bicolored and short-haired. 2 forms in eastern part of range: woodland and prairie. Woodland form has much longer tail and larger feet, ears, and body than prairie form. Woodland form: L 4 5/8 -8 3/4″ (119-222 mm); T 13/4 -4 7/8″ (46-123 mm); HF 5/8 -1″ (16-25 mm); E 3/4-7/8″ (18-21 mm); Wt 3/8-1 1/4 oz (10-33 g). Prairie form: L 4 1/8 -6 3/8″ (106-162 mm); T 1 7/8-2 5/8″ (48-68 mm); HF 1/2-3/4″ (14-19 mm); E 1/2-5/8″ (12-16 mm); Wt 3/8-7/8 oz (12.2-25.6 g). Warning: The droppings of the Deer Mouse have been associated with a sometimes fatal illness in humans called hantavirus. Never vacuum or sweep mouse droppings; thoroughly wet the area with a disinfectant, then carefully wipe up the droppings with a wet cloth. Similar Species Because it is the most common species in many small mammal communities and is exceedingly variable, the Deer Mouse can be difficult to distinguish from other Peromyscus species. In East, White-footed Mouseâ€™s tail is shorter than that of woodland form (tail of woodland form is more than half total length), and its tail and hindfeet are longer than those of prairie form (prairie formâ€™s tail is less than half total length). In West, PiÃ±on and Northern Rock mice have much longer ears. Most other western species have shorter tails. Breeding: Breeding season is variable, usually during the period that provides the best environment and food for raising young. Several litters per year of 2-7 young each; gestation 21-24 days. Sign: Prairie form: small burrows in ground or nests in raised areas, if available. Woodland form: nests in hollow logs. Western forms: nests in such protected places as underground burrows, clumps of vegetation, hollow limbs on or above the ground, and rock crevices, among others. Tracks: Similar to White-footed Mouse. Habitat Exceedingly variable: prairies and other grasslands; brushy areas; woodlands. Range N. West, S. Yukon and Northwest Territories to Mexico; in East, Hudson Bay to Pennsylvania and S. Appalachians, and across northern tier of states and south into C. Arkansas and E. Texas. The Deer Mouse occurs over a large geographic area and range of habitats, and is highly variable in appearance. More than 100 subspecies have been described. In the eastern portion of its range, there are two primary forms: the prairie and the woodland. The smaller prairie form (P. m. bairdii) occurs throughout much of the Midwest, whereas the many woodland forms occur in the Alleghenies and northward. It is presumed that the prairie and woodland forms in the eastern region form a continuous series of interbreeding populations whose habitats range from grasslands through brushy terrain to woodlands. The forms at the end of this continuum overlap in some areas, but they are separate morphologically and ecologically and do not interbreed. Thus they act as species, although they are not described as such and are referred to mainly as subspecies. This type of geographic pattern, called circular overlap, occurs occasionally but defies traditional taxonomic treatment, as it happens in a continuum, with interbreeding populations connecting the whole. Deer Mice are often highly arboreal. They feed on various foods, including seeds and nuts, small fruits and berries, insects, centipedes, and the subterranean fungus Endogone. The Deer Mouse caches food for winter use, routinely storing seeds and small nuts in hollow logs or other protected areas, but not as extensively as the White-footed Mouse. The most important foods of the prairie form include seeds of foxtail grass and wheat, among other sorts of seeds, as well as caterpillars and corn. The prairie form is common in cultivated areas and remains even during harvesting and plowing periods. It may have additional small refuge burrows as well as home burrows. The woodland form feeds on woodland nuts, seeds, and fruits as well as insects and other invertebrates. In the West, the Deer Mouse occurs in myriad habitats, feeding on the various seeds, fruits, nuts, caterpillars, and other insects available. Practically all predators of suitable size prey on this species, and since it is so common, it serves as a diet mainstay of many animals. Description: Grayish brown above; nearly as dark below. Tail dusky above and below; nearly hairless; less than half the body length. Ungrooved incisors. L 5 1/8-7 3/4″ (130-198 mm); T 2 1/2-4″ (63-102 mm); HF 1/2-7/8″ (14-21 mm); E 3/8″- 3/4″ (11-18 mm); Wt 5/8-3/4 oz (18-23 g). Similar Species: Deer mice (Peromyscus species) have white under parts. Harvest mice have grooved incisors. Breeding Gestation: 18-21 days; several litters per year, each of 3-16 young; reproduces spring through fall in North, year-round in South. Sign: Musky odor. In buildings: small dark droppings, damaged materials, holes in insulation, and shredded nesting material; in fields: small dark droppings, small holes in the ground. Habitat: Buildings; areas with good ground cover, especially cultivated fields. Uncommon in undisturbed or natural habitats. Range: Pacific Coast south from Alaska through W. and S. Canada and throughout all of continental U.S. The House Mouse originated in Asia and spread throughout Europe many centuries ago. In the early 16th century, it arrived in Florida and Latin America on ships of the Spanish explorers and conquistadores, and about a century later came to the northern shores of North America along with English and French explorers, traders, and colonists. The House Mouse makes its own nest but lives in groups, sharing escape holes and common areas for eating, urinating, and defecating. It takes turns grooming its fellows, especially on the head and back, where it is difficult for the animal to groom itself. If the population grows too dense, many females, particularly adolescents, become infertile. A highly migratory existence and rapid rate of reproduction enable the House Mouse to thrive; it takes advantage of situations not readily available to other species, including cultivated fields, which offer a rich if temporary habitat. As a crop develops, the mice move in and have several litters in quick succession, building large populations quickly; when the field is harvested or plowed, they move out. Many perish, many find other fields, and still others invade buildings. Sometimes these migrations assume plague proportions: In 1926-1927, an estimated 82,000 mice per acre (202,000 per ha) wreaked havoc in the Central Valley of California. In such densities, House Mice, though generally timid, have been known to run over people’s feet and even to bite. In cultivated fields, some of their actions are beneficial, as they feed heavily on weed seeds, with foxtail grass a favorite, along with caterpillars and other insects; in houses, barns, and storage buildings, they are entirely destructive. These mice eat or their droppings contaminate large quantities of grain and other valuable foodstuffs. Their scientific name derives from the Sanskrit musha, meaning “thief.” They chew or shred anything chewable or shreddable, including furniture and wires, and sometimes start fires. They can scurry up rough vertical walls and even pipes; they gnaw holes in walls, floors, and baseboards. Like Black and Norway rats, House Mice can spread disease. In the wild, birds and mammals are predators. Centuries ago, cooked mouse meat was a folk remedy for colds, coughs, fits, and fevers, but it is not recommended today. The white mice used in research laboratories are albinos bred from this species.